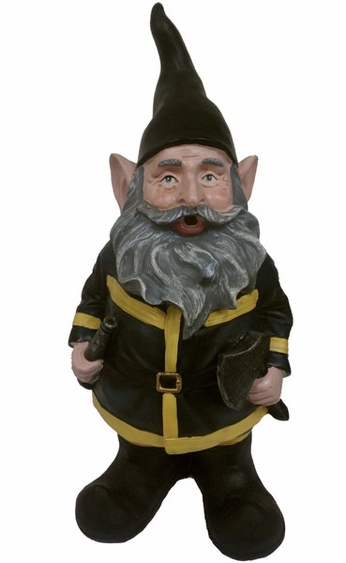 At GardenFun, we have a crazy assortment of different varieties of garden gnomes. Some are more traditional; others are contemporary and unique. Our Fireman Gnome honors those brave men and women firemen who put out blazes wherever they start. Our firefighter gnome is dressed in a black and yellow fireman's suit and stands at the ready with his hose and axe for whatever awaits. One can even imagine that he's shouting instructions to his fellow firefighters in action. This firefighter gnome stands tall at 13 inches and is made from cast stone resin that's weather resistant. If you'd like to start a collection of gnome emergency workers or gnomes with different occupations, we also have an expertly-detailed police gnome. No matter what your style or taste, if you've ever asked yourself "where can I buy a garden gnome?" the answer is "right here."